I always thought of these as neat issues. E254 being obviously the most common. Then Red Borders and the Tin Tops about the same for availability? With the Ju Ju Drums being much tougher to come by then any of the Colgan's. I can't add much value due to a lack of experience with Colgan's in general, but these cards have really grown on me. 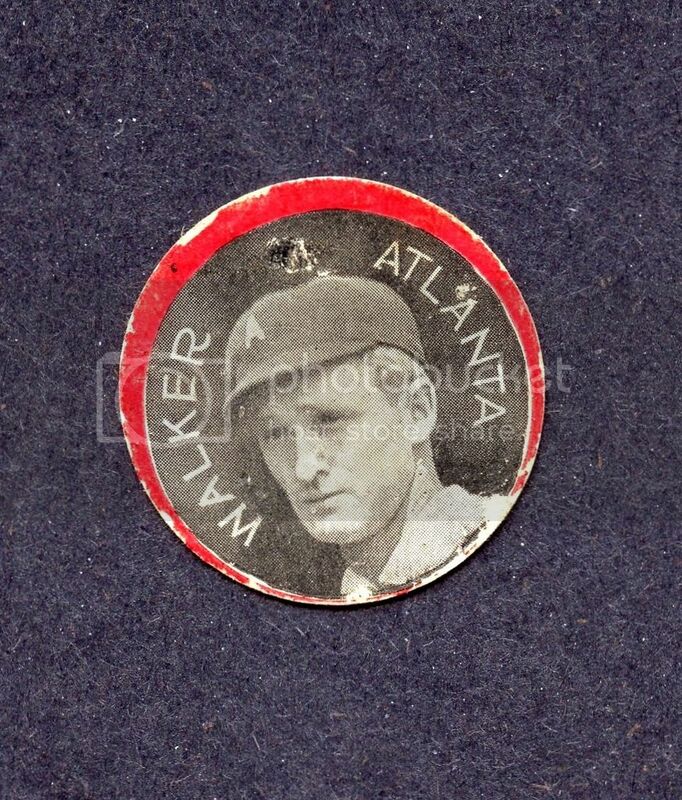 I'll edit this post later with a pic of my Honus Wagner Colgan's I got at National. Last edited by KMayUSA6060; 10-10-2018 at 09:47 AM. I always liked this issue too. It has a lot of minor leaguers. Some of the cards are exceedingly tough. There is a near set in the fall 2018 REA auction. Some nice Colgan's. I like 'em too. Last edited by brianp-beme; 10-10-2018 at 01:15 PM. Last edited by h2oya311; 10-10-2018 at 01:32 PM. Not a HOFer but my two of gramps aka Danny Murphy. I am seeking the tin top still if anyone has one available. Pop 4, pop 3 and pop 4. "208 Present in Series" ? Brian, Colgan's with "208 Present in Series" ? - not familiar with that, never seen that type, gotta check into it more. Learn something every day. Here is a thread about the 208's. Andy, thanks for info link. You guys remember the Skydash find? Many thought he wasn't for real, but then he posted, sure enough they were real and he had them. The Jim Thorpe amazed me! Would love to have that one. Here are two of my three Jersey City Colgan's chips. The other two are proofing tougher to find in a price I like. Zach Wheat and Babe Adams . Last edited by bobfreedman; 10-11-2018 at 02:01 PM. Last edited by DixieBaseball; 10-11-2018 at 09:58 AM. Don't forget about the Colgans Square Proof Issues... They would rank among the most rare. Here is my only example. 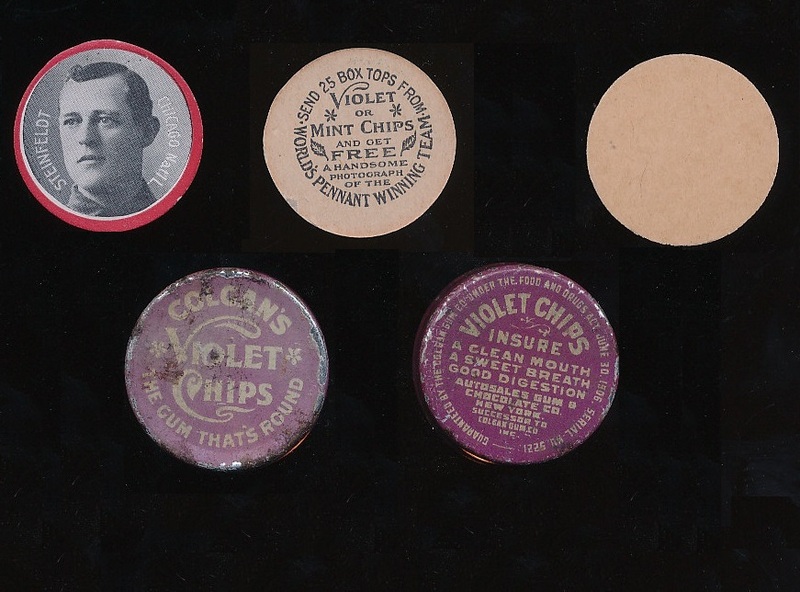 And a few pictures of Colgan's Chips containers. They are not mine. The Ju Ju Drums is available - PM me if interested. The back of my rusty tin. Since the Skydash Tin Tops find I think the Red Borders are the toughest to find and really hard to find centered. I wonder if anyone has ever attempted to put either set together I would think that would be impossible but you never know what could be out there. Toledo and Cleveland - both hard to find. Ju Ju Drums just sound cool! Reminds me of JuJuBees as a child! The double whammy of rarity! One of the top 10 toughest cards in the set with the toughest back. Great card! The Flick with Series of 208 is a great little card. 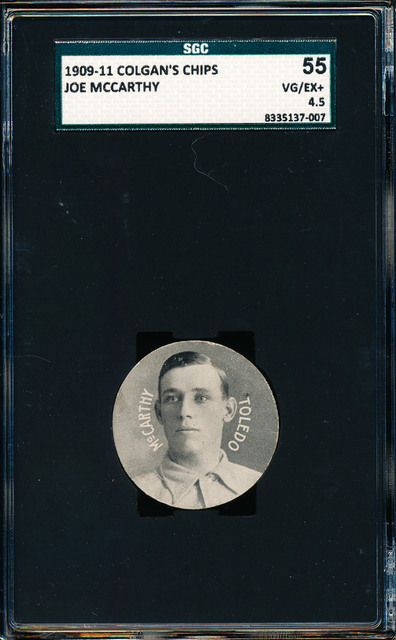 This E270 red border came with its container. Not much border chipping at all which is nice on these. so it was round flat gum that also helps digestion? Did violet taste like grape? 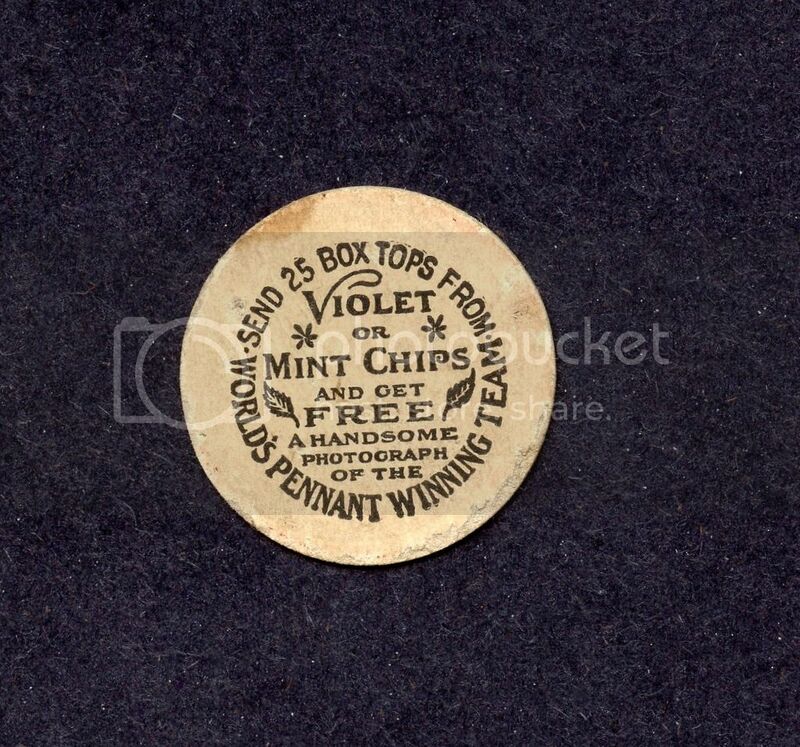 I imagine Violet Chips had a floral flavor. Not something that would be very popular today but it was a different time. The Violet Chips taste just like a big bunch of fresh violets smells. Cool ad. If that was a container which held a card then the price of the card was less than .10 cents and probably a lot less relative to the product. Not bad for an E270. Last edited by Leon; 10-21-2018 at 12:54 PM.